Day 1: Welcome to Bhutan from Hasimara Station - Phuntsholing 1/2Hrs. Meet & greet on arrival at Hasimara station(HSA)and drive to Indo - Bhutanese Border(Jaigaon-Phuntsholing) through the Tea Estates.After reaching check in Hotel.In afternoon process Bhutan Entry permit. Evening free for roam around India-Bhutan Border. After breakfast,Proceed Towards Thimphu via the wonderful mystic town Gedu, which is about 9000 ft above the sea and Chukha Dam. On the way visit Crocodile Park,Kharbondi Gumpha,Wankha Waterfalls in Phuntsholing and halt at Chojum to take photographs of confluence of two rivers of Bhutan, Thimphu Chu and Paro Chu. Reach Thimphu in the evening.Evening free for leisure. The National Memorial Chorten or Thimpu Chorten is a site for evening prayer. The chorten or Stupa was built in the memory of the third king , continuously circumambulated by people, murmuring mantras and spinning their prayer wheels. Construction of this landmark was the idea of Bhutan's third king, His Majesty Jigme Dorji Wangchuk ("the father of modern Bhutan") who has wished to erect monument to world peace and prosperity. Completed in 1974 after his untimely death, it serves both as a memorial to the Late King and as a monument to peace. Takin Zoo – You will find the National animal of Bhutan “Takin” in this open zoo. Takin is one of the most endangered species of the World and it is available only in Bhutan. The National Library has got a fabulous collection of Buddhist manuscripts which are priceless. It also houses the World’s largest published book which is about 130 pounds and 5X7 feet. Trashi Chhoe Dzong - or the Fortress of the Glorious Region is another ‘must visit’ site. Situated on the west bank of Wang Chhu river, Trashi Chhoe Dzong is the formal coronation site of the fifth King. The Dzong also hosts the annual Tsechu festival. Built in 1641 by the political and religious unifier of Bhutan, Shabdrung Ngawang Namgyal, it was reconstructed in 1960s in traditional Bhutanese manner, without nails or architectural plans. Dochula view point stop: The first stop after leaving Thimphu on the journey is Dochu La pass around 3100 m high and way above the clouds. Only an hour’s drive from Thimphu, it offers visitors their first glimpse of the Eastern Himalayan range. From the pass the road curls its way down into the relative lowlands of the Punakha Valley. Before Thimphu was made the permanent capital of Bhutan. Punakha Dzong: beautiful Punakha Dzong(known as the “the palace of great happiness”),located at the confluence of the Pho Chhu (father) and Mo Chhu (mother) rivers in the Punakha–Wangdue valley. the city’s dzong is one of the most picturesque of all Bhutan’s ancient fortresses The dzong is joined to the mainland by an arched wooden bridge, and contains many precious relics from the days when successive kings reined the kingdom from this valley. Chimi Lhakhang- Situated at the top of a hillock in the heart of Punakha valley, the Chimi Lhakhang is a site dedicated to Lama Drukpa Kuenley. Known as the ‘Divine Madman’, Lama Drukpa Kuenley is said to made use of songs, humour and his outrageous behavior to preach his teachings. Chimi Lhathang is actually a temple and is believed to be the temple of fertility. Bhutanese hold a strong belief that Couples who do not have children get blessed by Lama Drukpa Kuenley if they visit the temple and pray for a child. A picturesque rural trail through a paddy field takes visitors to the temple from the road. After crossing the paddy field you will find a tiny stream from where Chimi Lhakhang is a just a short climb away. In the morning,after breakfast start for Bumthang and reach Bumthang in afternoon.Evening free for leisure. Jakor Dzong –also known as 'Fortress of the White Bird', it was constructed in 1549 by Great grandfather of the first Shabdrung, initially as a monastery. Later it was upgraded in 1646, after the Shabdrung had firmly established his power. Jakar Dzong is now used as the administrative centre for Bumthang valley, and also houses the regional monk body. Jambay Lhakhang : It is a sacred monastery built in 7th century by the Tibetan King, Songtsen Gampo. Jambay Lhakhang is one of the 108 monasteries built by him to subdue evil spirits in the Himalayan region. Its present architectural appearance dates from the early 20th century however the inner shrine with the Future Buddha is believe to be there some 1400 years ago. Kurjey Lhakhang : Situated before Jambey Lhakhang, Kurje Lhakhang consists of three temples. The one on the right was built in 1652 on the rack face where Guru Padmasambhava meditated in the 8th century. Second temple is built on the site of a cave containing a rock with the imprint of Guru's body and is therefore considered, the most holy. The third temple was built in 1990s by Ashi Kesang, the Queen Mother. These three temples are surrounded by a 108 chorten wall. Tamshing Lhakhang : Located opposite Kurjey Lhakhang on the other side of the river, it was founded in 1501 by Terton Pema Lingpa. The lhakhang has ancient religious paintings such as 1000 Buddhas and 21 'Taras' (female form of Bodhisattva). The temple was restored at the end of the 19th century. Bajo Town After crossing the Punakha Sang Chhu (Fo-Chu-Mo-Chu) river,driver along the Wangdue Phodrang and visit newly developed small beautiful town, Bazo Town in Wangdue.After Bajo Town,visit Wangdue Fort. After Breakfast Start for Paro enroute visit the picturesque town - Simtokha Dzong is a small Dzong, Built in 1629 by Zhabdrung Ngawang Namgyal, who unified Bhutan, the Dzong is the first of its kind built in Bhutan. An important historical monument and former Buddhist monastery, today it houses one of the premier Dzong kha language learning institutes. Nya Mey Zam Bridge - "The Bridge with No Fish" is the bridge that connects Paro Town to Dzong It is one of finest specimens in Bhutan and local believes if one sees a fish in the river , it is ill omen..The earlier bridge which could be folded during war was washed away by flood in 1969. Drukgyal Dzong: Drukgyal Dzong was a fortress and Buddhist monastery, now in ruins, located in the upper part of the Paro valley in Paro District of Bhutan. The Dzong was probably built by Tenzin Drukdra in 1649 at the behest of Shabdrung Ngawang Namgyal to commemorate victory over an invasion from Tibet. 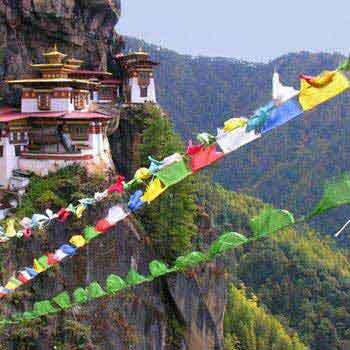 Taktsang Monastery: If you can brave the risky cliffs on a high mountain, Paro will astonish you in the form of Taktsang Monastery. After covering 1200 meters on a fierce cliff you will reach this sacred site, also known as the Tiger’s Nest. Take a deep breath after reaching the spot and then comfort your eyes and soul with the stunning view of the scenic surroundings and the valley lying underneath. 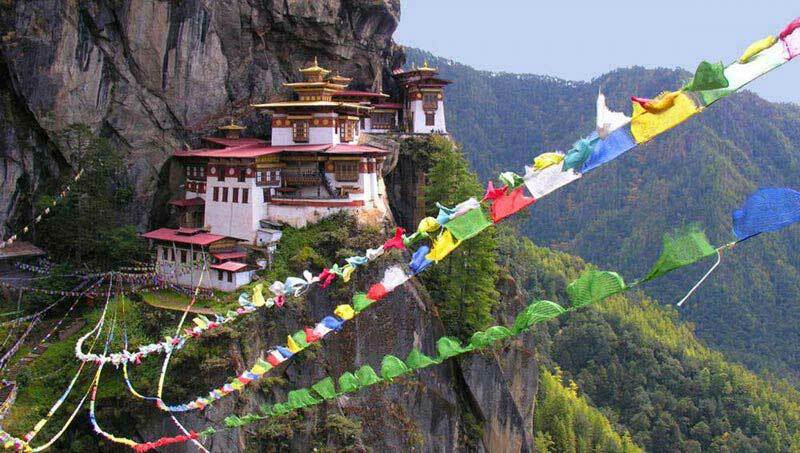 The Taktsang Monastery was established by Sain Guru Rinpoche who came to Bhutan in 747 CE. Construction of the complex was completed in 1694. Discovering the Tiger’s Nest after 3 hours of trekking is real adventure but you may also opt for a horse ride from the parking lot. Paro Airport View Point - This is finest valley view point to look after Paro Valley and Paro Airport. This view point overlooking the Paro river along with the all the Dzong's and Monastery. Haa remains one of the least visited areas in the country and retains the air of an unspoiled, primeval forest.Drive to Chele La Pass which (3,988m) from which on a clear day the view sweeps away to Bhutan’s second highest sacred peak, Mt Jhomolhari(7314m). After early breakfast,start for Hasimara Station with a sweet Bhutan Holiday memory and cherish Your memories forever.